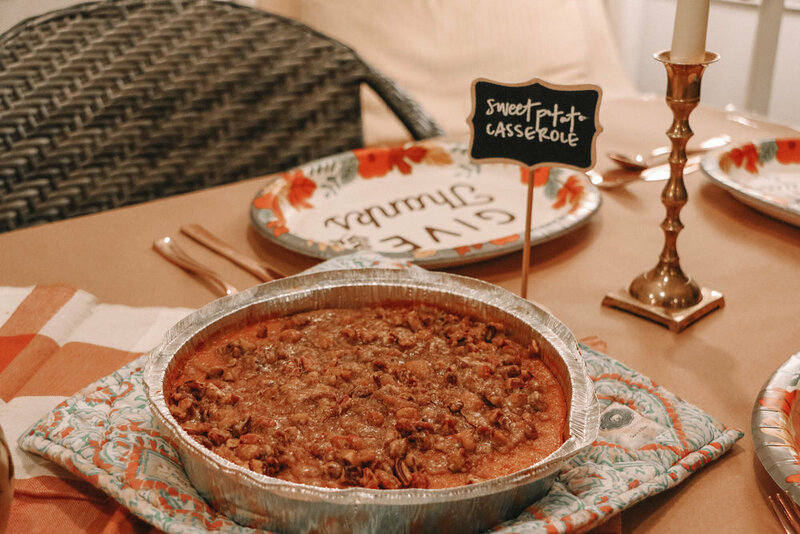 The other evening we hosted a Friendsgiving party and it was THE MOST fun! It was way easier than we ever anticipated so we wanted to share our tidbits and secrets with you this season! 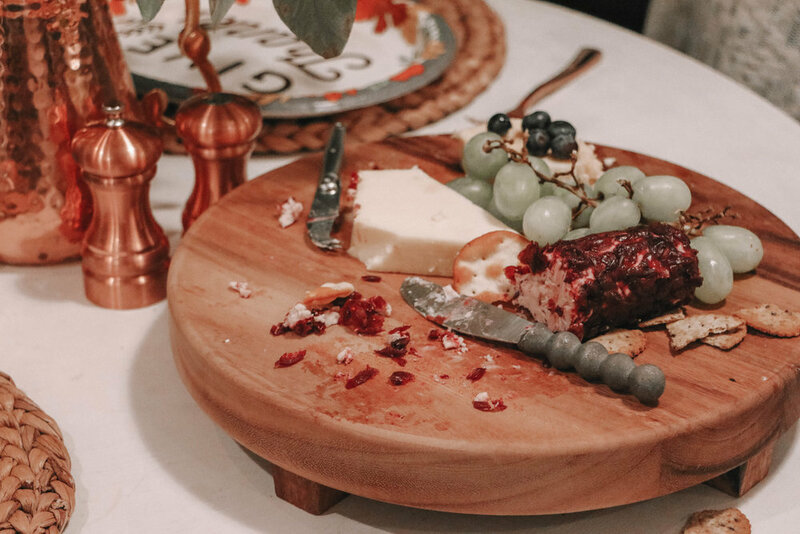 There are lots that go into this but it makes it all worth it once you have your friends and loved ones around a table breaking bread and laughter bouncing off of your walls! 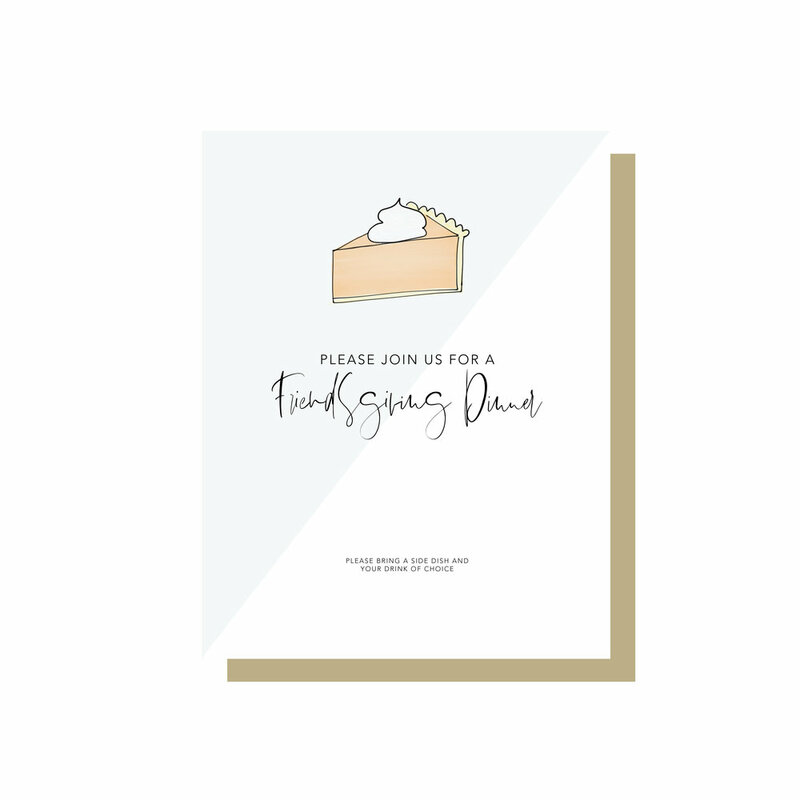 Yes, you could text your guests to let them know that you are hosting a fun party but how fun are invitations? I have always loved receiving a thoughtful invitation with information about the event and what I can expect in a fun way. This year, instead of doing printed and mailed invitations or e-vites, I designed my own invitation and sent it with the text. It says “you are thought of!” To use my design as a template for yours! Yes, you could go get lots of fun decor for your table and make it super fancy but I like to shop from my home! 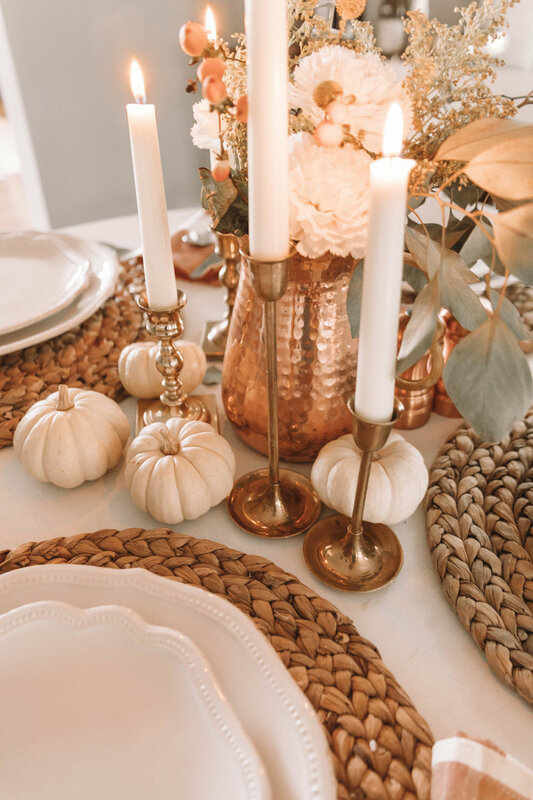 I go and grab pumpkins, fall decor, greenery, flower vases, platters, candlesticks and votives to decorate our space. If you’re having a smaller get-together, you could go with real plates, heck, you could even pull out your china if you’d like! Or, you could run to your favorite store (cough, Target, cough) and grab a few of your favorite festive plate and serving ware. We found dinner plates, dessert plates, and gold utensils. By no means do you feel like you have to prepare all of the food! On my invitation, I asked people to bring a side and drink of choice! That way, we had plenty of wine and food to go around! Need side ideas? 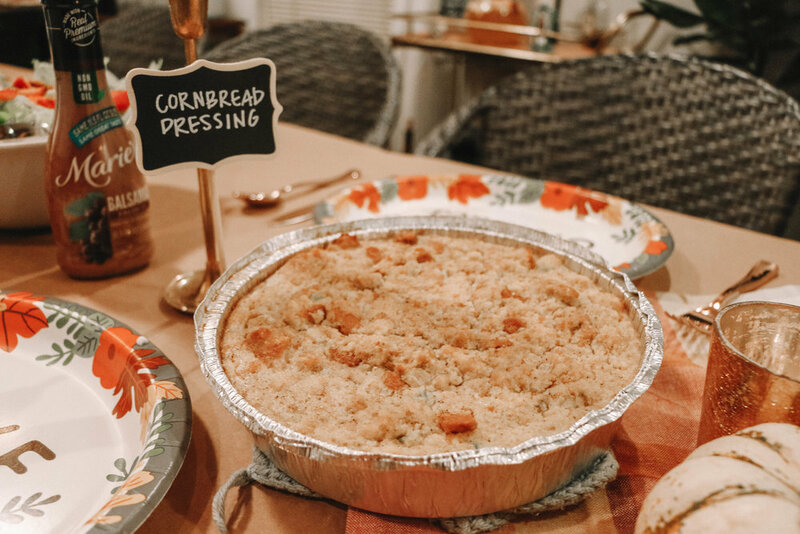 This Friendsgiving, I paired up with Ashley Mac’s in Birmingham, Alabama and they gave us the ham, sweet potato casserole, rolls, cornbread dressing, and pecan pie. They are AMAZING! 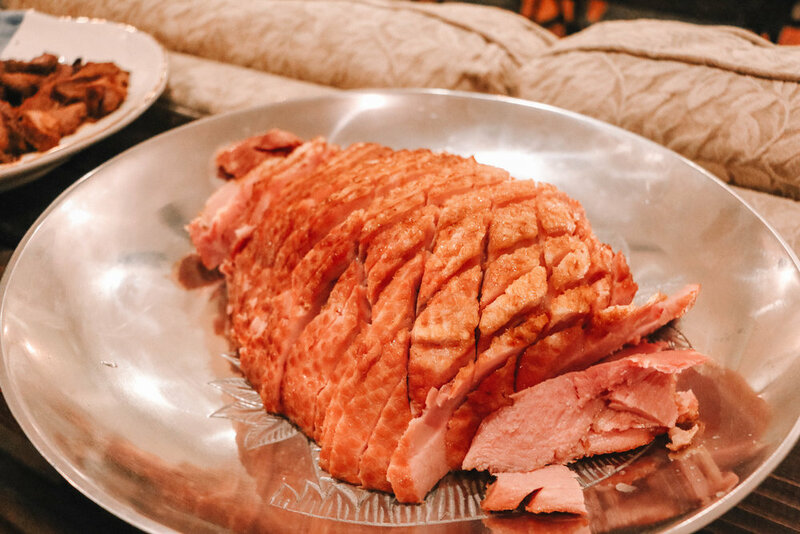 If you’re on-the-go or would want to easily impress people this Thanksgiving, make sure to put in an order from their Holiday menu! Use the code RACHEL10 for 10% off! All you have to do is pick it up, put it in your fridge and heat up with the direction on the top! So easy! Make sure to have platters and serving ware ready to go for your dishes, a lot of people will bring them without! That’s alright! It gives an occasion for those platters to come out of the pantry! I set up a buffet for ours using the long table for the sides. If someone wanted seconds, they could ask to pass the dish just like the good ole days! Pro tip: We heated up the dessert as people finished dinner! Of course, after asking people to bring their drink of choice, you’ll end up with a lot of yummy drink options. We provided a sangria for our guests and it was a HIT! Here’s the recipe! I created a jazz playlist that played the whole night. It’s upbeat enough to be tons of fun but smooth enough to not cause chaos! Feel free to use this at your upcoming Friendsgiving/Thanksgiving as well! Light your candles, turn off your heat (!! it will get toasty with all of those people), turn on your music and pull those dishes out of the oven, you’re ready for a party! Flower Truck Coming to Birmingham!